A special tool is required to insert a ring into the fluorocarbon resin Tube Fitting 20 and 20A Series. 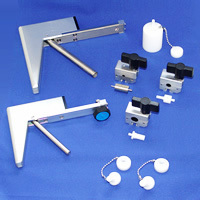 There are two types of ring insertion tools, the standard lever type and the simplified handy type. 20A Series have a flare attachment to flare the tube end before inserting the ring. Lever Type: The lever type ring insertion tool permits easy even mounting of rings. Handy Type: The handy type ring insertion tool utilizes a heating gun to warm a tube and insert a ring into it. This model of the ring insertion tool is especially effective where short tubing is used or where work areas are limited.